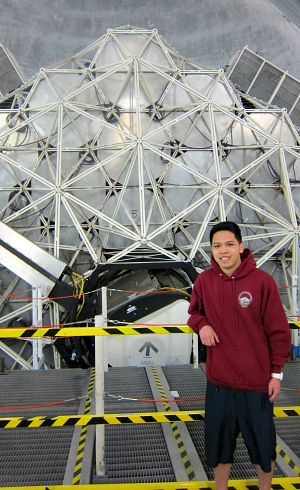 Richard Vo, ’14 Physics, inside the W. M. Keck Observatory on the summit of Mauna Kea, Hawaii. The observatory houses the world’s largest optical and infrared telescopes, which collect data Richard uses for his research (photo courtesy of Richard Vo). As the youngest of 10 in a low-income family, this San Jose native found his future in the stars, though life hasn’t always seemed as brilliant as the galaxies he’s admired. As a result of their parents reverence for hard work, Richard’s oldest brother Trung Vo said all of his siblings are self motivated. If ever they desired to participate in an extracurricular activity, they had to provide the funds. “Now we appreciate what we work hard for… We all can survive anywhere,” he said. “It doesn’t matter the conditions, we’ll adapt, and that’s the good thing about (growing up with little resources). When you’re a kid, you look at others like ‘Oh man, how come they have everything I don’t have’ but now that I am grown, I’m glad we went through that because now I understand we can live (through anything).” Richard Vo has had many different jobs since he was 16, from bowling alleys and retail to tutoring, to get what he wanted. Tutoring has been especially rewarding. When I help somebody out and they do well, it puts a smile on my face,” he said. Richard’s co-curricular and extracurricular activities have helped him build confidence (Christiana Cobb photo). He found the change he was longing for first in his fraternity. 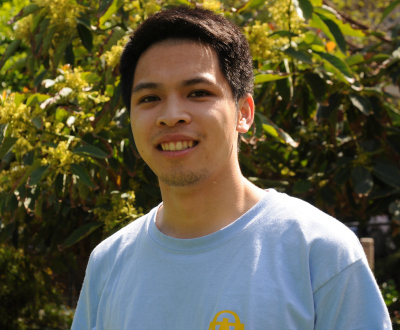 During his sophomore year, Richard contemplated transferring to the University of Southern California but at the same time, he joined Alpha Omega Tao and became more involved at SJSU. Part of Richard’s initial dissatisfaction with SJSU came with his disconnection with his electrical engineering major, which he entered after much influence from his brother Trung. Trung, a mechanical engineer, advised Richard to be an engineer because of Richard’s skill in math and science. 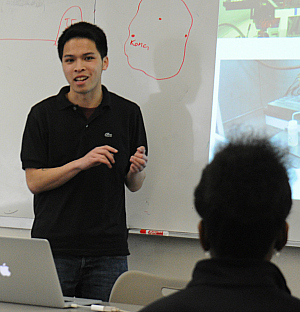 Trung knew that being an engineer is a good way to make a living quickly after college. Richard said that engineering was something his brother “knew” Richard would be good at, but Richard was not convinced, so he switched. Richard siblings are not very supportive of his career path because they don’t quite understand what he is studying or what he will do with his degree. As the youngest, Richard said he feels the pressure to succeed and be the “the biggest shining star in the family.” However, Trung said that he truly wants Richard to be happy and have the best life he can. Trung said he advised Richard that in his pursuit of physics and higher education, he should work to financially support his endeavors. 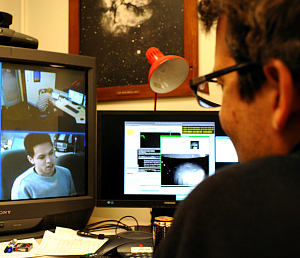 From the Keck Observatory telescope room, Richard video chats with Assistant Professor Aaron Romanowsky in San Jose (photo courtesy of Romanowsky). Richard began to truly understand what he wanted to do after his first physics class. “When I took my first physics class, that’s when I got the idea of majoring in physics,” he said. He said changing majors is one of the greater decisions of his life. It’s always really good to figure out what you want to do and what you have a passion for,” Richard said. As a newer professor, Romanowsky said this was the first time a student approached him about doing any independent study research. In January 2013, Richard began his research. Though he had been intrigued with astronomy and the stars, he didn’t quite understand what today’s astronomers do. Romanowsky introduced him to using software to find different astronomical objects, which upon further inspection may turn out to be stars, supernovas, galaxies, asteroids – any number of things twinkling in the night sky. “You know looking though telescopes doesn’t really happen these days, it’s basically like giant digital cameras,” Romanowsky said. 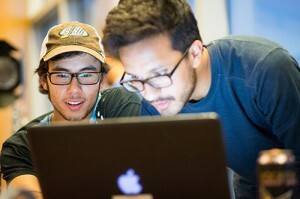 Richard conducted research this term at the Keck Observatory while preparing to publish details of his major discovery (photo courtesy of Richard Vo). In fact, the first time Richard looked into a telescope was last summer when he had the opportunity to look into his nephew’s. Once he nailed down the computer skills, Richard stumbled upon his own discovery, which will soon be described in detail in an academic journal. For now, all Richard can share is his discovery is linked to a paper Romanowsky released in September about the sighting of an ultra-compact galaxy, the densest of its kind up to that point. Richard’s discovery is a record breaker and younger than other like objects. 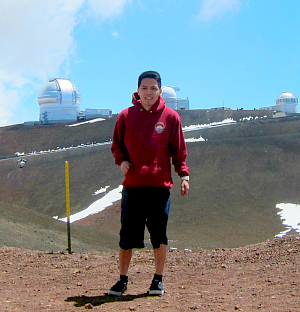 As of a result of his finding, Richard had the opportunity to do further research this term at the W. M. Keck Observatory on the summit of Mauna Kea on the island of Hawaii. Richard worked tirelessly with people all over the world and was in awe of the technology used to observe at his object. He said he hopes this is not the end of his education, as he prepares to write his journal article and look deeper into his object. Despite his success as a student, Richard expressed concerns for what happens after he receives his bachelor’s degree, though he does desire to go to graduate school and continue researching. The Native American Student Organization (N.A.S.O), Trader Joe’s representatives, students participating in their global climate change class, and many more gathered on Tower Lawn under the shining sun for a breezy Earth Day with performances, interactive displays and a petting zoo. The SJSU community came together to watch Smokey Bay Dancers from the Indian Health Center of Santa Clara celebrate “Mother Earth.” However, people were reminded that the event was also participatory as a drummer encouraged the crowd to grab the hand of someone next to them for a friendship dance. N.A.S.O invited the Smokey Bay Dancers to SJSU to participate in the Earth Day festivities and educate students about the Native American culture in San Jose. “We want to let them (the SJSU community) to know we (Native Americans) are here on campus,” said Bethany Richmond, ’14 Psychology. Richmond, treasurer of N.A.S.O and part of the Kumeyaay tribe, also led an interactive bracelet-making activity. The bracelets, made of colored beads—red, white, black and yellow—were representative of the four directions: east, south, west and north. According to Richmond, the four directions represent “ways of life” and have certain significance to the many Native American tribes. Take Back the Tap, a national campaign that is part of Food and Water Watch, was popular as students lined up to fill their little tasting cups with the different types of water and complete the surveys. Student organizer Adam McAndrews, ’15 Environmental Science, said he and his group mates for his global climate change course set up Take Back the Tap booth to bust some of the myths surrounding tap water. Students took an introductory survey, blindly tasted the water and took a follow-up survey. Though McAndrews said the results seemed pretty even for tap and bottled water, the group wanted to make sure students left the booth with more information about water. 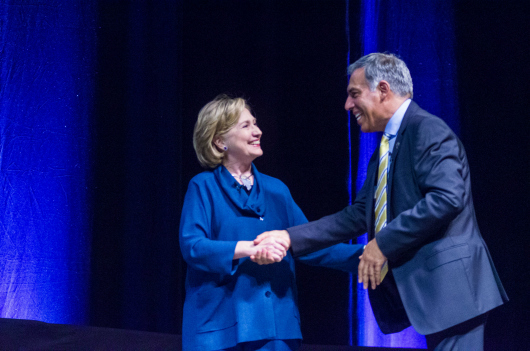 President Qayoumi welcomes Hillary Clinton to the Event Center (Brandon Chew photo). Women must dare to compete. Hillary Clinton faced thousands of community members and students in the San Jose State Event Center the evening of April 10, challenging women to break down the glass ceilings and messages projecting self-doubt and perfectionism that often stifle them in the workforce. 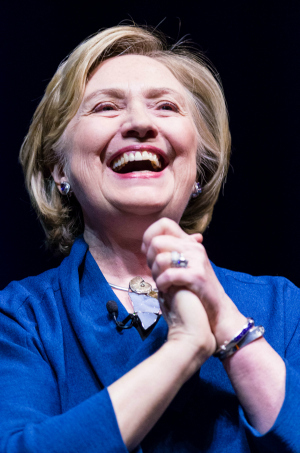 Despite crowds of more than 75 people from the Constitution party chanting “open your eyes, poor guide,” trying to bring awareness about Clinton and the Benghazi “scandal” in 2012, guests said their excitement to see one of their “favorite” politicians couldn’t be suppressed. The audience ranged from people young and old, male and female, families and singles. In section 2 of the Event Center, where one had a clear side view of Clinton, sat a father and his son. Ian Sills, 13, said he is an aspiring politician, and he’s always admired the issues on which Clinton has worked. Eric, his father, and a Justice Studies lecturer at SJSU, said he too has always been impressed by her political stance and knew this was one event he wanted to make sure he and his son attended. 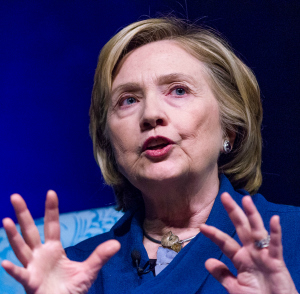 “I think she’s been through a lot, gone through a lot, but I think she’s got a lot still to do,” Eric Sills said referring to Clinton’s possible run for the presidency in 2016. As Clinton walked onto the stage, she greeted the standing, cheering crowd (Brandon Chew photo). 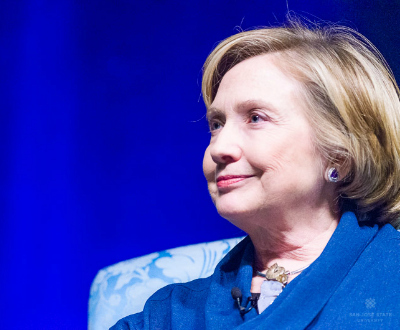 Expectancy of Clinton’s candidacy filled the room as one student, Maddy Ferrito, ‘15 European Studies, said “it’s about time,” that America has such a promising possibility in a woman candidate for president. The evening began with university President Mohammad Qayoumi introducing Clinton. “So tonight, Madam Secretary, you are an honorary Spartan,” he said. As Clinton walked onto the stage, she greeted the standing, cheering crowd with a smile, waving her hands and saying “thank you” as the audience responded with I love yous. As the audience gazed at Clinton, she urged the audience to take a look at women’s rights in America and the world. She hit on an issue close to home at SJSU. Though the university has a thriving engineering program and other science and math programs, the percentage of women in those career paths is modest. “Women account for just 11 percent of directors on technology boards. That’s a problem right here in this region,” Clinton said. As a woman in a male dominated field, she said she’s always had to compete. Stone wanted to emphasize Clinton’s inspirations to be the woman she is today. With two women in mind, Clinton shared how her mother Dorothy Rodham and Eleanor Roosevelt were her instrumental inspirations. Clinton’s mother was orphaned as a young girl, lived a very poor life but desired to go to high school. She said her mother worked as a young girl taking care of a neighborhood woman’s children. During that time, Rodman’s neighbor told her that if she continued to watch the children, she could go to school. “Her story is not my story but it influenced who I became and it really gave me an appreciation for how important it is that we take care of each other.” Though Rodham was abandoned by her parents and grandparents, Clinton said those who stepped in to care for her mother made all the difference. 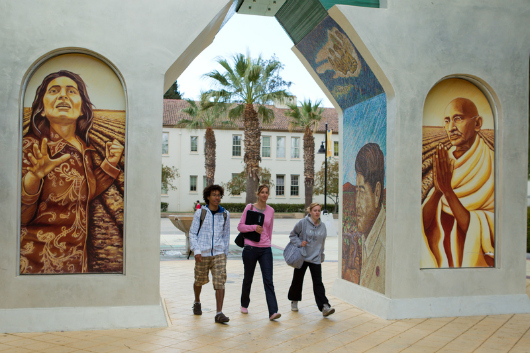 The César E. Chávez Monument: Arch of Dignity, Equality and Justice on the grounds of San Jose State (Bruce Cramer photo). In a world with more than eight billion people, just one can make a difference when a life is used to better someone else’s. “I have a button that says ‘one person can do so much’,” said Leila McCabe ’12 Sociology . 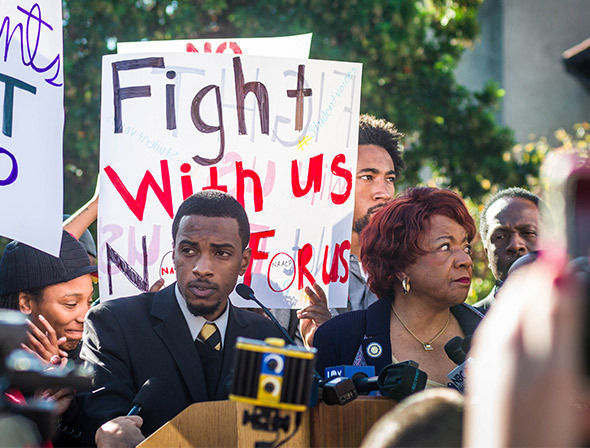 “I feel like it’s my duty to help improve people’s lives, but I love doing that.” McCabe, and others such as Elisha St. Laurent, ’13 Behavioral Science and Sociology, were among some of the students who campaigned to raise the minimum wage in San Jose starting in 2011. Though the campaign recently celebrated its one-year anniversary, they have not stopped fighting for the rights of others. Maribel said the CCCAC and volunteers will work with Veggielution to reconnect with the land and harvest as a way to celebrate the impact that Cesar Chavez made in the San Jose community. McCabe said though generation X can be a generation that works for self interest, she has begun to see a shift in her group of friends, as people look to be part of social justice issues and campaigns. St. Laurent, who also worked on the Measure D campaign, said though people such as Chavez are highlighted when talking about people who make a difference in social justice issues, there are others who selflessly serve. “We’re all tired … The idea of actually getting up and wanting to empower [your] community or wanting to be a part of [your] community just on [Cesar Chavez day] or one week is great, but you should wake up every day like that, wanting to help people because every day people wake up homeless,” St. Laurent said. She said time is precious and she has often sacrificed time for herself for others because any day can be a chance to change someone’s life. “I make time because God made time for me … It took me realizing that my life should be of servitude to others,” she said. McCabe said it’s her passion to help others, and she feels empowered to see change in her community. “I can’t not try to make a difference when I know that we have the power to make change,” she said. 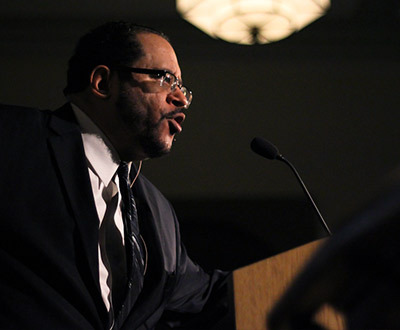 Michael Eric Dyson, acclaimed author, professor, political analyst and holder of a doctorate in religion, delivered a provocative lecture in response to alleged hate crimes at San Jose State (Christina Olivas photo). Dyson, acclaimed author, professor, political analyst and holder of a doctorate in religion, delivered a provocative lecture in response to alleged hate crimes at San Jose State. More than 500 people of different ethnicities, genders and ages flooded Morris Daily Auditorium, sitting and standing for the lecture Monday evening. Is racism an issue in 2014? Before the lecture, Adam Ahmed, ’17 Microbiology, and a member of the lecture’s planning team, said he was curious about Dyson’s take on race as he found it shocking that in 2014 racism is still a problem, especially at SJSU. However, other attendees anticipated Dyson’s lecture would shed light on a dark reality in America. I think it’s interesting how people of color seem to be the only ones who think that racism still exists and that it’s still a prevalent issue,” said Najma Sadiq, a DeAnza College student. 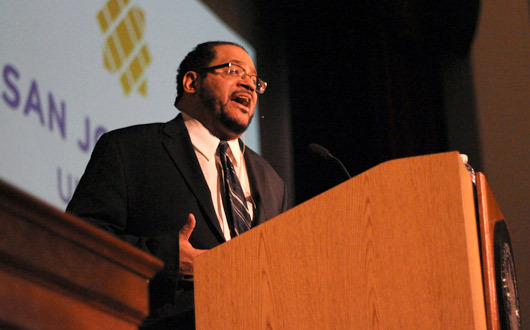 During the lecture, Dyson walked the audience through the history of race in America. He emphasized the vast importance of understanding America’s racialized history before we can move forward. Dyson expressed how this concept is almost as absurd as blaming a diseased person for the creation of their disease. His voice boomed in the auditorium as he went on to make three points relating to how people can respect race and differences. Dyson in front of the iconic Smith/Carlos sculpture at SJSU (Christina Olivas photo). Next, he encouraged the audience to develop an appreciation for racial specificity without being racially exclusive, which means one must realize that race is an essential part of individuals’ stories in the United States. Lastly, he said diversity must be for the sake of a just goal. For example, if people of diverse ethnic backgrounds ostracize someone based on sexual orientation, an injustice is being perpetuated amidst superficial diversity. During the question and answer period, Rigo Garcia, ’15 Mexican American Studies, shared his observation that although the university touts diversity, ethnic studies departments don’t have the perceived support that one may expect. This was promoting diversity for an unjust goal, Garcia said, before asking how he can be part of those who instead seek diversity for justice within the ethnic studies programs. Students crowd Dyson for handshakes and pictures (Christina Olivas photo). After the questions subsided, audience members rushed and crowded Dyson for handshakes and pictures. Ahmed said he was struck by the professor’s point that we are not in a post-racial society even though the country has its first black president. “People believe with [President Barak Obama’s] election that we are done with race, ‘been there done black,’” Dyson stated, followed by laughs from the audience as he explained much remains undone. San Jose State President Mohammad Qayoumi, faculty and staff attended four San Jose churches to inform families that it’s never too early to strive for higher education during CSU Super Sunday Feb. 16. Parents and youth, such as Jahne Hill, a high school sophomore, sought more insight into college readiness. Whatever choices you make now affect what you are going to do in the future, especially for college,” she said. Grandmother Flavor Dyer, ’81 Liberal Studies, encouraged her three young grandchildren to introduce themselves to Qayoumi at Emmanuel Baptist Church, as she insisted that they too would be doctors. Catherine Mann, ’12 Art and Art History, waited for Qayoumi’s arrival after the 8 a.m. service because she wanted to shake the hand of her alma mater’s president. Qayoumi participated in the entirety of the 11 a.m. service, standing, sitting and bowing in reverence to the speakers, songs and prayers before he spoke to the congregation about financial and admission opportunities within the CSU system. Despite campus dissonance, Qayoumi said the administration wants to make SJSU more hospitable. If there are changes that need to be done whether it’s in our training, whether it’s in our outreach, whether it’s the general knowledge [or] whether it’s the policies, changes will be incorporated,” he said. 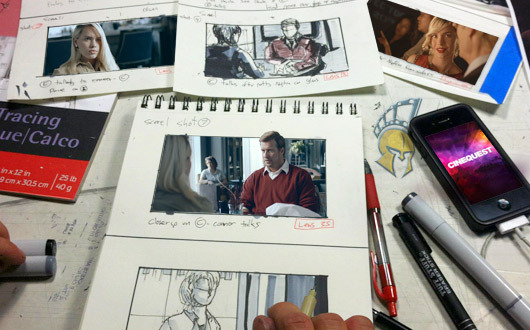 Spartan Film Studios staff storyboards “Park Arcadia,” a short-film to be showcased at this year’s Cinequest Film Festival. Student filmmakers may walk into the Radio-Television-Film department as amateurs but they are soon immersed in the filmmaking industry through Spartan Film Studios and the Cinequest Film Festival student short contest. “Park Arcadia,” a short-film and “Mis Ojos Estan Sangrando” (“My Eyes Are Bleeding”), a student-short, will be showcased at this year’s Cinequest. The whole point of going into film school is to have projects where you can also get real-world experience,” said Shebaz Aslam, ’13 Radio-Television-Film, producer, co-writer and cinematographer. “Park Arcadia,” a high-concept short film, captures the story of a young woman who uses her murdered father’s invention, a dimension-jumping watch, to find a reality where he is alive. 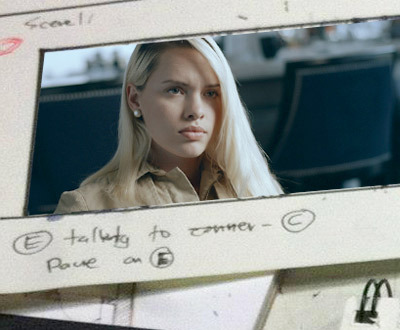 Falling into this year’s Cinequest theme of “connect,” this film focuses on the main character desperately seeking to reconnect with her father, said Barnaby Dallas, Spartan Film Studios co-director. Darren Rae, ’13 Radio-Television-Film and Shebaz Aslam, ’13 Radio-Television-Film. Aslam said he and Darren Rae, ’13 Radio-Television-Film, director and co-writer, developed the short after brainstorming science fiction ideas about multi-dimensions. Both Darren and I had been interested in film and we both dealt with the death of family member whom we were close to, and we played with this idea,” he said. Rae said the film’s writing allows the audience to explore the character and what she experiences. The film rivals anything that you would see professionally in Hollywood,” said Nick Martinez, co-director of Spartan Film Studios. “Park Arcadia” was produced by an all-student crew with professional mentors during the summer. Liam Goulding, ’14 Radio-Television-Film, “Park Arcadia” script supervisor and casting director, said he enjoyed working with the crew in the summer program, but he also took it upon himself to submit his own student-short to Cinequest. “Mis Ojos Estan Sangrando” (“My Eyes Are Bleeding”) is a four and a half minute short that highlights the life of a filmmaker who is daunted by the task of filming the brutality of the Mexican cartels. Goulding said this short is far from “cheesy zombie movies” he shot with his cousins at age 14. Black students have rallied, marched and protested their way to recognition, promoting solidarity every step of the way. 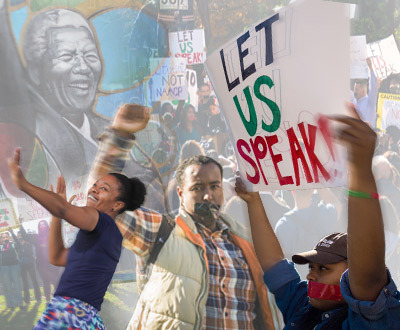 After feeling nearly invisible a year ago, black students last term rallied, marched and protested their way to recognition, promoting solidarity every step of the way. The result? Stronger relationships and communication within the black community surrounding this year’s Black History Month events. “We are making great strides, we are more unified than we were a year ago,” said Danielle Miller, ’15 Political Science, and current Black Student Union president. Former BSU president Alyxandra Goodwin, ’14 Journalism, has seen changes in the administration’s approach to Black History Month. In the past, she and other black organization members were frustrated and felt that the administration did not take notice. 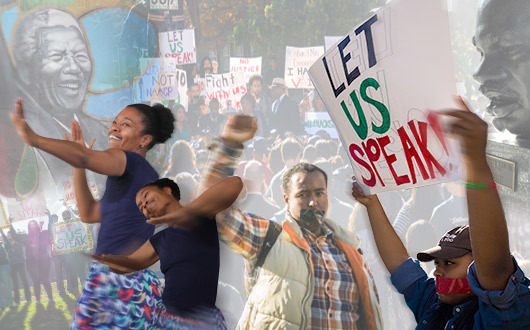 Sasha Bassett, ‘14 Behavioral Science and Sociology, and MOSAIC diversity advocate intern, said it’s imperative that SJSU honor the different perspectives and cultures on campus. Gary Daniels, ‘15 Political Science and Alpha Phi Alpha president. 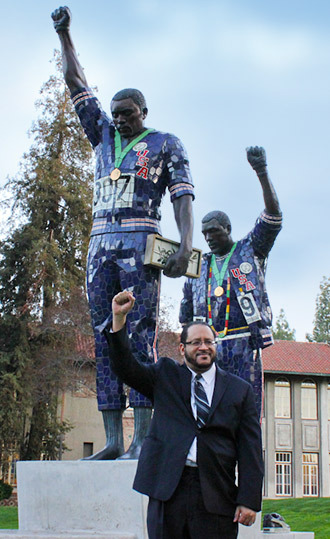 Gary Daniels, ‘15 Political Science, and Alpha Phi Alpha president, added that in the last year, student leaders developed the Black Unity Group, a coalition of student-run black organizations that advocates for the rights of black students as well as other marginalized groups at SJSU. Last February, students marched on “Black Thursday” for recognition of blacks on campus and against the opinion article “Black History Month is Redundant,” published in the Spartan Daily. Daniels said that the rally was the first display of black unity and the movement has grown. Danielle Miller predicts this growth will continue, in spite of trials and tribulations.